Don’t panic, this is not an article about the lemon and lime fizzy drink, Boku Slots have not gone mad. 7Up is actually a refreshing slot game hailing from the design team at Gamevy. As always, we’re here to give you the finer details on this game, so you can decide if you want to play. 7Up is a 3-reel, 7 pay line slot game which offers a basic scratch card theme, but don’t be fooled by its simplicity. 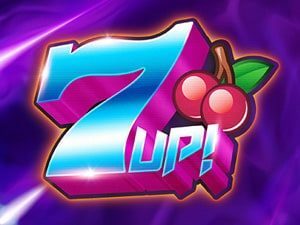 Inspired by the slot machines of old, 7Up has a plethora of fruit filled symbols waiting to be matched up. Plus, there’s a generous RTP of 92.02%, which means you could enjoy a great return. 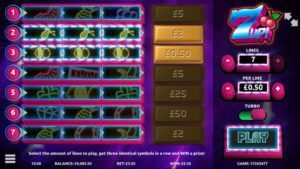 Bet Amounts – You can play from as little as 2p per pay line, to a maximum of £10 per pay line if you wish to amend your stake amounts. The pay lines can be amended so you can play with 1 line or up to all 7, it’s your choice. This means your bet amount can range from as little as 2p right up to the maximum of £70, dependant on your choice of stake and pay lines in play. Symbols – Your symbols range in order from highest paying to lowest which are as follows: 7, bars, bells, diamond, clover, horseshoe, melon, blackberries, pineapple, banana, lemons and cherries. Collect any 3 of these symbols on a single pay line and you will win the allocated value of that symbol, multiplied by the bet amount. Features – No features to roll through with 7Up, just 7 amazing lines making 7 equally amazing chances of winning big. When all 7 lines are in play you can win on multiple lines, none of this highest paying line wins nonsense here. 7Up has tipped its hat to the high energy vibe of the dance era, with its neon glowing symbols and rave style sound track (which you can mute if you wish as its quite loud). It has stuck to a simple yet fun design that is easy to play on all devices, making it a great all-rounder. The turbo option allows play to be sped up, for those of you that simply can’t wait the 10 seconds for the reels to stop to see if you have won. Overall it offers easy play, a retro theme with a modern twist and simplicity. We probably spent far longer playing than we thought we would, so 7Up really won us over.